THE KASHKAIE RUG - Traditional rugs made of the famous wool-wefts, warps, and pile-though. The Kashkaie are nomadic herders of the Zagros Mountains, a spectacular desert range located in southwestern Iran. Descended from Turkman and Azeri tribes who migrated to the area from central Asia in the 12th century AD, Kashkaie have lived for centuries in this unforgiving area as nomadic pastoralists. While many have settled into partially sedentary lives, others continue to raise sheep, donkey, and cattle traditionally, migrating from summer to winter pastures in an unbroken cycle stretching back to their first ancestors. It is a historic sight: twice per year the lonesome surney trumpet sounds, and the 300 mile migration between high summer pastures ("Yailaq") in the north and low winter pastures ("Qishlaq") in the south begins. The Kashkaie assemble men, women, children, tents, animals, and supplies in an impossible mile-long caravan that, from a distance, appears as a flash of brilliant color—the reds and blues and greens of their extraordinary clothes and textiles standing out against the hills. That this tradition and culture have survived not only modernization, but forceful attempts to integrate the population into greater Iran, is a feat of tremendous resilience. 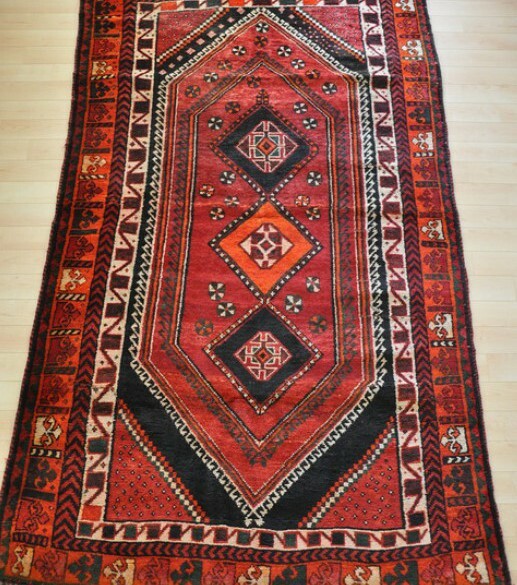 In this traditional nomadic culture, carpets are an integral part of life. Kashkaie women have always woven rugs for daily use as coverings for food and storage, as floor carpeting, and for bedding. The originals were utilitarian, woven primarily for strength, durability, and in the case of bedding, for warmth. But the textiles of the Kashkaie were never merely functional. As centerpieces of an entire cultural aesthetic, the rugs have always been regarded as objects of art and as unique expressions of their makers' visions. Drawing on this art of their traditional rugs, the Kashkaie tribe began producing for the international market in the 19th century, and among other great textile-producing nomadic tribes of Iran, quickly became famous as weavers of some of the finest Persian rugs on the market. Using vertical looms, the women weave Kashkaie carpets that balance coarse and fine, with an average of 170 knots per square inch. It is in many ways at the center of their social life. Joining six or seven strong to simultaneously weave a single carpet, women will often turn carpet-making into hours of conversation and even song. Their designs are varied, though often draw on patterns most commonly found in the Caucasus, where Kashkaie ancestors are said to have settled on their long migration from central Asia. Among these, perhaps the most prevalent is the central diamond motif with fields full of spontaneously woven detail. The patterns are created with exceptional local materials. Traditional rugs are made entirely of the region's famous wool--wefts, warps, and pile--though newer rugs sometimes have cotton wefts. 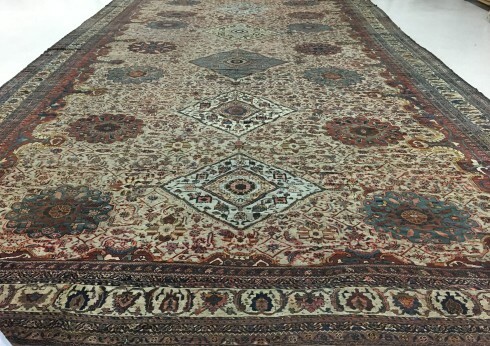 Many experts feel that Kashkaie wool, which is particularly firm and translucent, holds natural dyes uniquely, and indeed, the rugs are known for their rich, naturally variegated red, blue, green and brown hues. The dyes themselves are worth noting: antique Kashkaie rugs are created only with natural vegetable dyes, hand-gathered as herbs, berries, and barks from the mountains. The results are the famously saturated, vibrant colors of the Kashkaie rugs, which seem to emerge organically from the landscape itself.